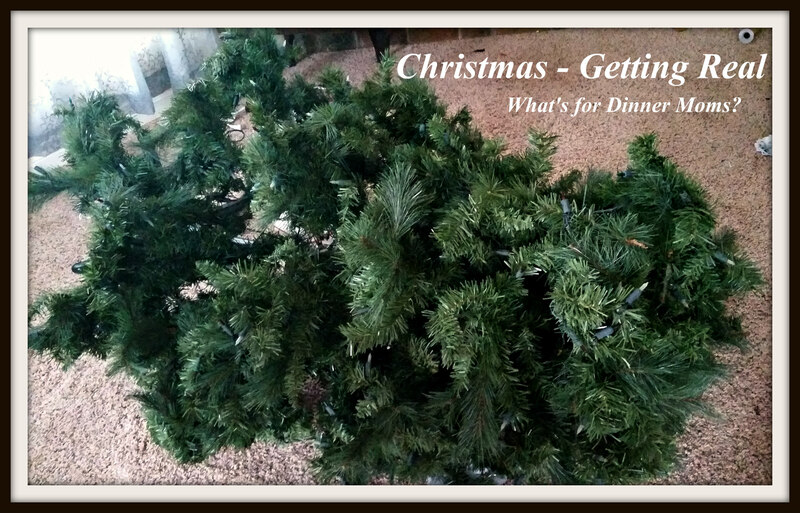 Christmas – Getting Real – What's for Dinner Moms? This is not a blog about getting a real Christmas tree. This is about time, patience, and figuring out what matters to you. No matter what holiday you celebrate this time of year it seems to get insanely busy with school concerts, community concerts, parades, community events (we even have a Reindog Parade here! – Dogs dressed in costumes parade through town), and then just all the other usual stuff our families are involved in. Things get dropped from our traditions or need to be altered because no matter how much we want to fit it all in, we just cannot do it all. So, I am known for being on top of Christmas. When it comes to the holidays I LOVE them. I am ultra organized because I want to enjoy the whole experience of Christmas, Hanukkah, and all the days in between. My gifts are bought by November 15th, at the latest, and wrapped by December 1st. My tree goes up the first weekend in November. Our cards are done and ordered by November 15th and addressed to be mailed by December 1st. We start baking Thanksgiving weekend and finish on Christmas Eve with the German Kuchen. It is all planned out. It usually works pretty well, except for this year. Don’t get me wrong. The gifts are purchased, just not wrapped. The cards are here, just not addressed to mail. Then there is the tree. Yes, that is our tree. This picture was taken 15 minutes ago. This tree has been laying on the floor in the middle of the room for 2 weeks. We walk around it. Look at it. Consider moving it. Then leave it right where it is. Last year when the tree was put away one leg to the stand was left out of the box. We remember it going down to the basement, or so we think. We know we put it somewhere safe. Because, where else would we put it? We searched all the Christmas bins and the tree box. All the shelves where we put stuff for safekeeping. I even cleaned my closet where I store gifts wondering if I put it in there to discover as I wrapped gifts. Nothing. I have been putting off buying a new tree because you know the minute we do we will find the leg. Gah! I even thought of ordering a new leg but the tree is too old. So, what do we do? So, this is Christmas for us right now. My son and partner are out Christmas shopping and have decided to purchase a tree. Maybe it will be up by tomorrow. But, in the mean time we are cleaning and baking cookies today. Yes, the tree is important and the cards are important but to me the baking and spending time with my family are more important. The tree will make it up by December 24th and the cards will get mailed. If they are Happy New Year cards, oh well. I will be drinking my eggnog in front of the fireplace and singing carols. Have fun this month. Find what brings you joy this holiday season and do it! Enjoy the moments and find what brings you JOY! I’m sure you are baking up something delicious! My tree is still only half assembled from three days ago but I will finish it today. Thanks! Good luck on getting your tree up today. I am still hoping for tomorrow but we will see. Wow you are so organized Marci! 🙂 Usually, I am very organized. Just not this year. It is hard to always being organized! I also am not this year. Thanksgiving was quite interesting Marci. I realized the night before we had no turkey ooops. I have lists for my lists and planners on top of planners, not this time! You have quite a bit going on! You are right it is hard to always be organized. Sometimes things just get in the way. Good for you for taking it all in stride. Pingback: Christmas Peppermint Puppy Chow – What's for Dinner Moms? Thank you so much! I too love the holidays and cutting back a bit where no one will notice is probably the easiest way to make it easier.